• Barack Obama, The irreversible momentum of clean energy, Science, 13 January 2017. Since it’s open-access, I’m going to take the liberty of quoting the whole thing, minus the references, which provide support for a lot of his facts and figures. The release of carbon dioxide (CO2) and other greenhouse gases (GHGs) due to human activity is increasing global average surface air temperatures, disrupting weather patterns, and acidifying the ocean. Left unchecked, the continued growth of GHG emissions could cause global average temperatures to increase by another 4°C or more by 2100 and by 1.5 to 2 times as much in many midcontinent and far northern locations. Although our understanding of the impacts of climate change is increasingly and disturbingly clear, there is still debate about the proper course for U.S. policy — a debate that is very much on display during the current presidential transition. But putting near-term politics aside, the mounting economic and scientific evidence leave me confident that trends toward a clean-energy economy that have emerged during my presidency will continue and that the economic opportunity for our country to harness that trend will only grow. This Policy Forum will focus on the four reasons I believe the trend toward clean energy is irreversible. The United States is showing that GHG mitigation need not conflict with economic growth. Rather, it can boost efficiency, productivity, and innovation. Since 2008, the United States has experienced the first sustained period of rapid GHG emissions reductions and simultaneous economic growth on record. Specifically, CO2 emissions from the energy sector fell by 9.5% from 2008 to 2015, while the economy grew by more than 10%. In this same period, the amount of energy consumed per dollar of real gross domestic product (GDP) fell by almost 11%, the amount of CO2 emitted per unit of energy consumed declined by 8%, and CO2 emitted per dollar of GDP declined by 18%. At the same time, evidence is mounting that any economic strategy that ignores carbon pollution will impose tremendous costs to the global economy and will result in fewer jobs and less economic growth over the long term. Estimates of the economic damages from warming of 4°C over preindustrial levels range from 1% to 5% of global GDP each year by 2100. One of the most frequently cited economic models pins the estimate of annual damages from warming of 4°C at ~4% of global GDP, which could lead to lost U.S. federal revenue of roughly $340 billion to $690 billion annually. Moreover, these estimates do not include the possibility of GHG increases triggering catastrophic events, such as the accelerated shrinkage of the Greenland and Antarctic ice sheets, drastic changes in ocean currents, or sizable releases of GHGs from previously frozen soils and sediments that rapidly accelerate warming. In addition, these estimates factor in economic damages but do not address the critical question of whether the underlying rate of economic growth (rather than just the level of GDP) is affected by climate change, so these studies could substantially understate the potential damage of climate change on the global macroeconomy. As a result, it is becoming increasingly clear that, regardless of the inherent uncertainties in predicting future climate and weather patterns, the investments needed to reduce emissions — and to increase resilience and preparedness for the changes in climate that can no longer be avoided — will be modest in comparison with the benefits from avoided climate-change damages. This means, in the coming years, states, localities, and businesses will need to continue making these critical investments, in addition to taking common-sense steps to disclose climate risk to taxpayers, homeowners, shareholders, and customers. Global insurance and reinsurance businesses are already taking such steps as their analytical models reveal growing climate risk. Beyond the macroeconomic case, businesses are coming to the conclusion that reducing emissions is not just good for the environment — it can also boost bottom lines, cut costs for consumers, and deliver returns for shareholders. Perhaps the most compelling example is energy efficiency. Government has played a role in encouraging this kind of investment and innovation. My Administration has put in place (i) fuel economy standards that are net beneficial and are projected to cut more than 8 billion tons of carbon pollution over the lifetime of new vehicles sold between 2012 and 2029 and (ii) 44 appliance standards and new building codes that are projected to cut 2.4 billion tons of carbon pollution and save $550 billion for consumers by 2030. But ultimately, these investments are being made by firms that decide to cut their energy waste in order to save money and invest in other areas of their businesses. For example, Alcoa has set a goal of reducing its GHG intensity 30% by 2020 from its 2005 baseline, and General Motors is working to reduce its energy intensity from facilities by 20% from its 2011 baseline over the same timeframe. Investments like these are contributing to what we are seeing take place across the economy: Total energy consumption in 2015 was 2.5% lower than it was in 2008, whereas the economy was 10% larger. This kind of corporate decision-making can save money, but it also has the potential to create jobs that pay well. A U.S. Department of Energy report released this week found that ~2.2 million Americans are currently employed in the design, installation, and manufacture of energy-efficiency products and services. This compares with the roughly 1.1 million Americans who are employed in the production of fossil fuels and their use for electric power generation. Policies that continue to encourage businesses to save money by cutting energy waste could pay a major employment dividend and are based on stronger economic logic than continuing the nearly $5 billion per year in federal fossil-fuel subsidies, a market distortion that should be corrected on its own or in the context of corporate tax reform. The American electric-power sector — the largest source of GHG emissions in our economy — is being transformed, in large part, because of market dynamics. In 2008, natural gas made up ~21% of U.S. electricity generation. Today, it makes up ~33%, an increase due almost entirely to the shift from higher-emitting coal to lower-emitting natural gas, brought about primarily by the increased availability of low-cost gas due to new production techniques. Because the cost of new electricity generation using natural gas is projected to remain low relative to coal, it is unlikely that utilities will change course and choose to build coal-fired power plants, which would be more expensive than natural gas plants, regardless of any near-term changes in federal policy. Although methane emissions from natural gas production are a serious concern, firms have an economic incentive over the long term to put in place waste-reducing measures consistent with standards my Administration has put in place, and states will continue making important progress toward addressing this issue, irrespective of near-term federal policy. Renewable electricity costs also fell dramatically between 2008 and 2015: the cost of electricity fell 41% for wind, 54% for rooftop solar photovoltaic (PV) installations, and 64% for utility-scale PV. According to Bloomberg New Energy Finance, 2015 was a record year for clean energy investment, with those energy sources attracting twice as much global capital as fossil fuels. Public policy — ranging from Recovery Act investments to recent tax credit extensions — has played a crucial role, but technology advances and market forces will continue to drive renewable deployment. The levelized cost of electricity from new renewables like wind and solar in some parts of the United States is already lower than that for new coal generation, without counting subsidies for renewables. That is why American businesses are making the move toward renewable energy sources. Google, for example, announced last month that, in 2017, it plans to power 100% of its operations using renewable energy — in large part through large-scale, long-term contracts to buy renewable energy directly. Walmart, the nation’s largest retailer, has set a goal of getting 100% of its energy from renewables in the coming years. And economy-wide, solar and wind firms now employ more than 360,000 Americans, compared with around 160,000 Americans who work in coal electric generation and support. Beyond market forces, state-level policy will continue to drive clean-energy momentum. States representing 40% of the U.S. population are continuing to move ahead with clean-energy plans, and even outside of those states, clean energy is expanding. For example, wind power alone made up 12% of Texas’s electricity production in 2015 and, at certain points in 2015, that number was >40%, and wind provided 32% of Iowa’s total electricity generation in 2015, up from 8% in 2008 (a higher fraction than in any other state). Outside the United States, countries and their businesses are moving forward, seeking to reap benefits for their countries by being at the front of the clean-energy race. This has not always been the case. A short time ago, many believed that only a small number of advanced economies should be responsible for reducing GHG emissions and contributing to the fight against climate change. But nations agreed in Paris that all countries should put forward increasingly ambitious climate policies and be subject to consistent transparency and accountability requirements. This was a fundamental shift in the diplomatic landscape, which has already yielded substantial dividends. The Paris Agreement entered into force in less than a year, and, at the follow-up meeting this fall in Marrakesh, countries agreed that, with more than 110 countries representing more than 75% of global emissions having already joined the Paris Agreement, climate action “momentum is irreversible”. 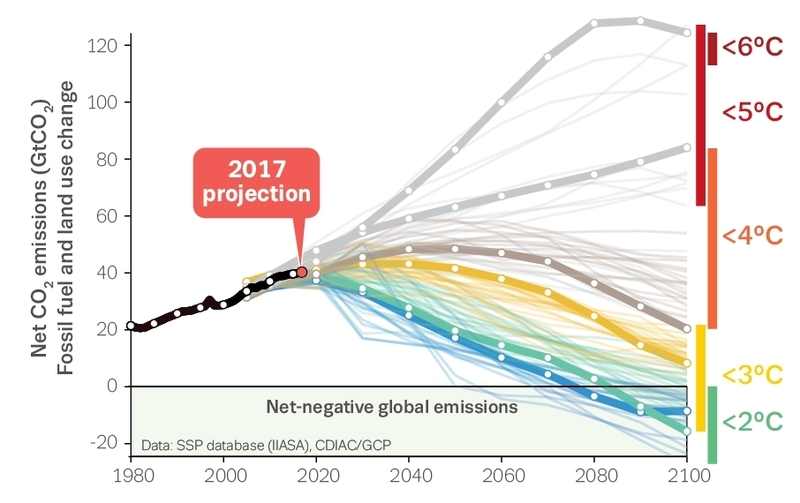 Although substantive action over decades will be required to realize the vision of Paris, analysis of countries’ individual contributions suggests that meeting mediumterm respective targets and increasing their ambition in the years ahead — coupled with scaled-up investment in clean-energy technologies — could increase the international community’s probability of limiting warming to 2°C by as much as 50%. Were the United States to step away from Paris, it would lose its seat at the table to hold other countries to their commitments, demand transparency, and encourage ambition. This does not mean the next Administration needs to follow identical domestic policies to my Administration’s. There are multiple paths and mechanisms by which this country can achieve — efficiently and economically — the targets we embraced in the Paris Agreement. The Paris Agreement itself is based on a nationally determined structure whereby each country sets and updates its own commitments. Regardless of U.S. domestic policies, it would undermine our economic interests to walk away from the opportunity to hold countries representing two-thirds of global emissions — including China, India, Mexico, European Union members, and others — accountable. This should not be a partisan issue. It is good business and good economics to lead a technological revolution and define market trends. And it is smart planning to set long term emission-reduction targets and give American companies, entrepreneurs, and investors certainty so they can invest and manufacture the emission-reducing technologies that we can use domestically and export to the rest of the world. That is why hundreds of major companies — including energy-related companies from ExxonMobil and Shell, to DuPont and Rio Tinto, to Berkshire Hathaway Energy, Calpine, and Pacific Gas and Electric Company — have supported the Paris process, and leading investors have committed $1 billion in patient, private capital to support clean-energy breakthroughs that could make even greater climate ambition possible. We have long known, on the basis of a massive scientific record, that the urgency of acting to mitigate climate change is real and cannot be ignored. In recent years, we have also seen that the economic case for action — and against inaction — is just as clear, the business case for clean energy is growing, and the trend toward a cleaner power sector can be sustained regardless of near-term federal policies. Despite the policy uncertainty that we face, I remain convinced that no country is better suited to confront the climate challenge and reap the economic benefits of a low-carbon future than the United States and that continued participation in the Paris process will yield great benefit for the American people, as well as the international community. Prudent U.S. policy over the next several decades would prioritize, among other actions, decarbonizing the U.S. energy system, storing carbon and reducing emissions within U.S. lands, and reducing non-CO2 emissions. Of course, one of the great advantages of our system of government is that each president is able to chart his or her own policy course. And President-elect Donald Trump will have the opportunity to do so. The latest science and economics provide a helpful guide for what the future may bring, in many cases independent of near-term policy choices, when it comes to combatting climate change and transitioning to a clean energy economy.